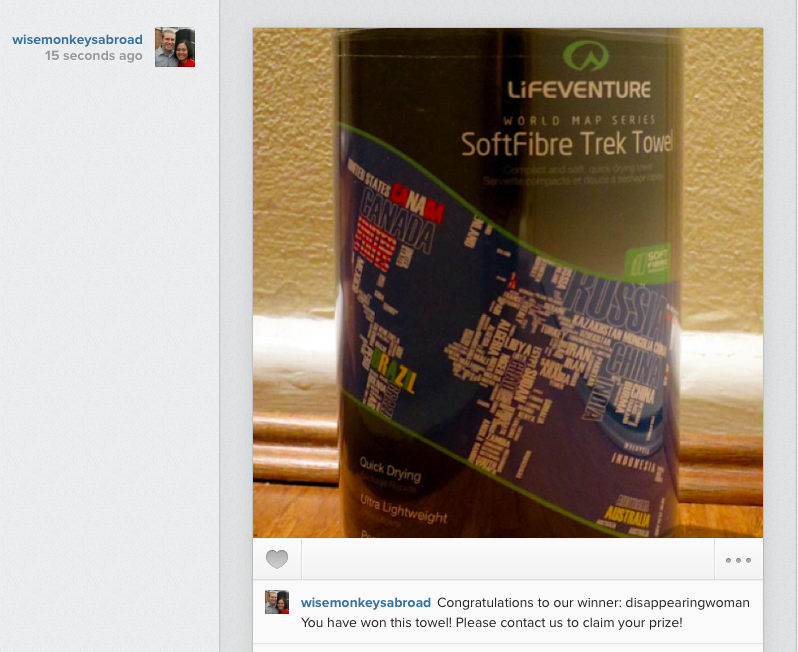 This morning we randomly selected our winner of the Lifeventure SoftFibre Trek Towel! You have 48 hours to claim your prize. Send us an email with your postal address and we will get the towel posted to you as soon as possible. Thank you so much everyone for entering and for getting involved with our first ever GIVEAWAY! And a huge thank you to Silverfox Travel and Outdoors for providing us with the prize! If you would like to get your hands on this towel or other travel-related products, head on over to their website. The winner has been announced on Facebook, Twitter and Instagram. Congratulations to "disappearingwoman" for winning the trek towel (courtesy of @Travel_Outdoors ) – You have 48 hours to claim your prize! This entry was posted in Giveaways and tagged giveaway, winner. There are times when we want a towel that is light-weight, quick-dry and easy to pack. 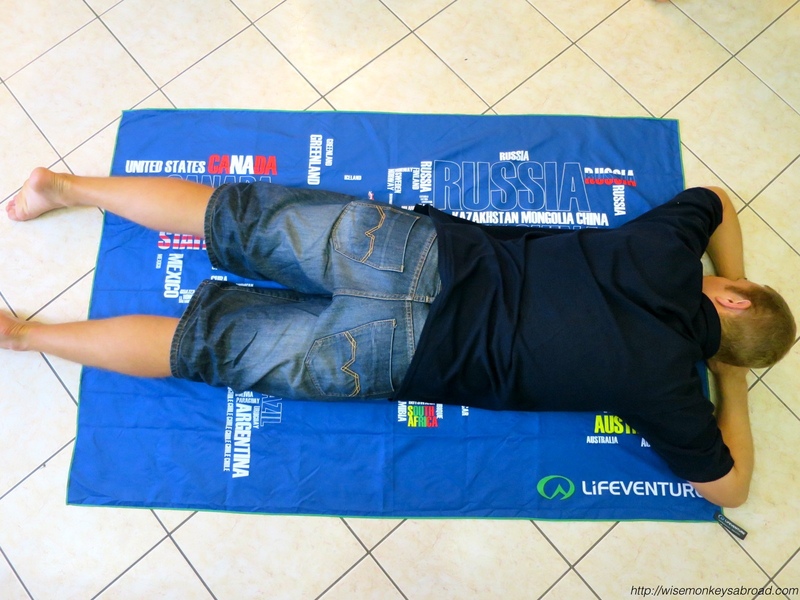 And we may have found it: the Lifeventure SoftFibre Trek Towel. The first thing we notice is that the towel is very light for its size. Measuring in at 150 cm by 100 cm, it weighs slightly over 300 grams. It can easily double as a picnic rug /blanket not just a towel. Considering we have just completed the Camino, we were thinking of all our fellow walkers who may have appreciated something like this. The next thing which we give it the thumbs up for: it doesn’t have the same texture as the usual “quick-dry” towels. We are not fans of other microfiber towels, which are linty and have that “static”-kind of feel to them. In contrast, this towel is smooth, soft and has an almost lens-cloth feel. Not feeling the usual soft fluffy towel when drying the face is one little thing we need to get used to. But, what amazed us the most was its capability to dry! After a shower, David wrapped himself in the towel and the towel almost magically soaks up the water from his body. The great thing about this product, it absorbs the water but does not feel wet. It simply feels damp. We trialled soaking it in about 2L of water, pulled it out dripping wet, hung it in our bathroom overnight. And by the morning, it was merely damp. And aesthetically? 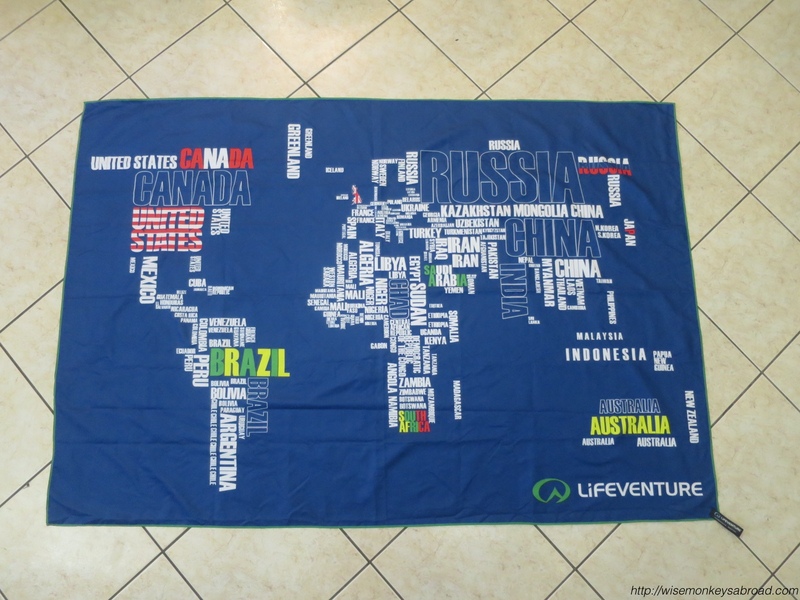 The print on the towel is very fitting for anyone interested in travel, geography or the world. It is cleverly laid out as a map of the world with the country name representing its location. 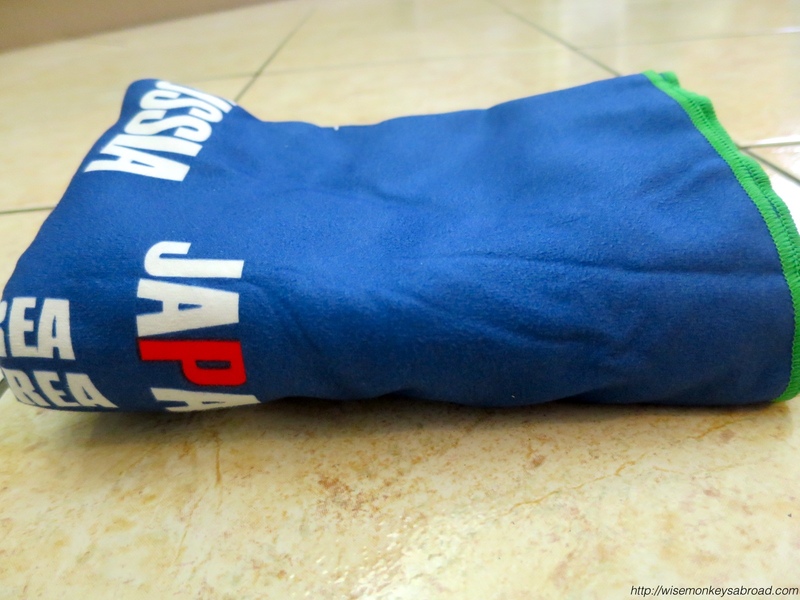 Due to its size, it can easily be used as a beach towel. On our quest to find our favourite beach in Sydney – using this towel will come in handy for us to trial during our Sydney summer! The last thing we want to say on this towel is how compact it becomes. It folds down easily and fits in its small mesh pouch that is included. Described as quick drying and ultra light-weight, we are quite convinced that it is that 🙂 It is also stated to have “permanent antibacterial treatment“, which we cannot provide comment on as we don’t have the capability to test it with accurate results. This is a towel we will be taking on our next adventure 🙂 and are thrilled to be able to give one away to a reader! And what about the #WMAgiveaway bit? So without further ado, one of our readers can win a BRAND NEW Blue Lifeventure SoftFibre Trek Towel (valued at £26.99, courtesy of Silverfox Travel & Outdoors online shop). The #WMAgiveaway starts now and ends at midnight 1 December, 2014 (Sydney, Australia Time). Let’s have some fun – this giveaway requires no skills or creativity. It is based purely on luck 🙂 (Name-out-of-a-hat type of luck). Follow us on Instagram (for one entry) and leave a comment (“I want to win it” or similar) on the photo of the towel (for one entry). Please note: All comments made by current followers will automatically get a bonus entry for already being a follower 🙂 Any crude, obscene or inappropriate comments as deemed by us will be removed and will NOT count as an entry. At the end of the giveaway, we will put all names in a hat and literally draw out a winner. We will announce the winner on all of our social media on December 3rd and the winner will have 48 hours to claim their prize. Good luck and we look forward to hosting a successful first giveaway! Thank you Silverfox Travel & Outdoors for providing the towels. These towels can be purchased from their website. Disclaimer: Although, we have been provided the towels for our review and giveaway, our opinions expressed in this post is entirely our own. 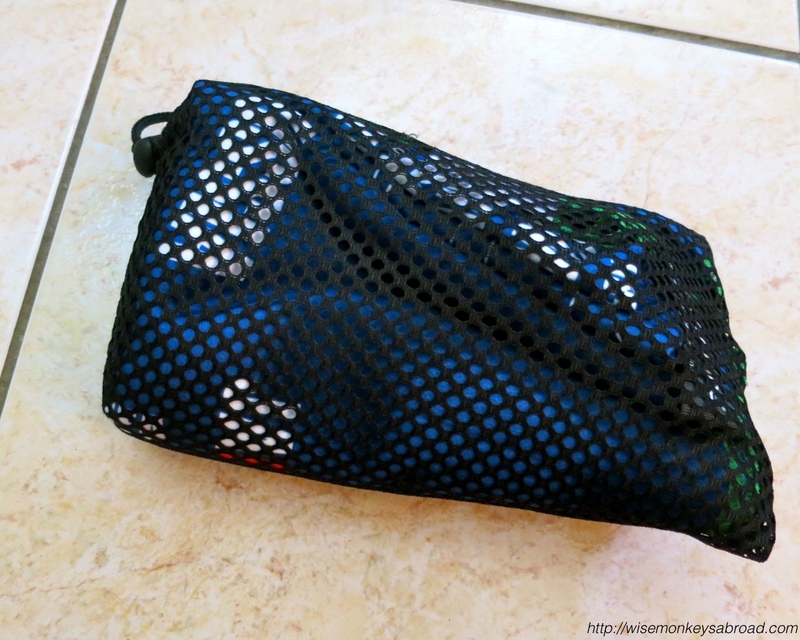 This entry was posted in Product Review, Reviews and tagged competition, giveaway, light weight, product review, towel, Travel, travel accessory.